Kyle Seager is hitting .279/.354/.468 in 175 PA’s in 2013 for the Mariners. On Friday, the Mariners sent rookie Brandon Maurer to battle Ubaldo Jimenez. Jimenez outpitched Maurer, throwing a dominant five innings, striking out nine. Nonetheless, Maurer pitched well enough to win and kept the Mariners in the game, exiting in the sixth inning with the score tied at three apiece. Two innings later, Raul Ibanez was stranded on third, after both Endy Chavez and Brendan Ryan failed to drive him in. After neither team could get anything going for a few innings, Lucas Luetge came in to pitch in the bottom of the 10th with nobody on base and one out. After a Michael Brantley groundout, Luetge needed only one out to send the game into the 11th. Drew Stubbs worked a five-pitch walk, then Michael Bourn singled and all of a sudden the Indians had the go-ahead run on third base with Jason Kipnis at the plate. Luetge threw a 86 MPH slider for a strike to start the at bat, then decided to throw the exact same pitch again. With a fastball that sits at around 90 MPH, Kipnis was waiting on a pitch around that speed, and Luetge’s slider didn’t have the movement that it needed to be effective. Kipnis extended his swing and the hit the ball right over the right field wall to win the game and send the Indians fans home happy. Just twenty hours after the conclusion of that tough loss, the Mariners sent Joe Saunders, who has struggled all year on the road, to the mound. aunders has a 3.16 FIP. However, on the road, his FIP has blossomed to 7.90. The Mariners need Saunders to be able to get his road numbers to improve quickly, so he won’t lose confidence pitching in other stadiums. Back to the game, the Mariners trailed 0-4 heading into the eighth inning. In the top of the eighth, Justin Smoak got things started with a leadoff double. Later, Brendan Ryan hit his first homer of the season to drive in Smoak and bring the Mariners to within two runs. Just one inning later, both Raul Ibanez and Justin Smoak hit clutch back-to-back homers with two outs to tie the game up. In the bottom of the ninth, the Mariners sent in Oliver Perez, questionably, to try to send the game into extra innings. However, after a Jason Kipnis leadoff single followed by an Asdrubal Cabrera double, things were looking grim for the Mariners. Manager Eric Wedge called for Nick Swisher to be intentionally walked, bringing Mark Reynolds to the plate with the bases loaded. Reynolds hit a weak grounder to shortstop Brendan Ryan, who made an athletic play and quickly threw the ball to catcher Jesus Montero. It appeared the Mariners got the out, but Montero was not touching the plate and the Indians got their second straight walk-off victory. With Felix Hernandez on the mound facing Justin Masterson, the Mariners are already in a very good position to win Sunday’s game. As long as the Mariners can give Felix a few runs, he should be able to lead the Mariners to a win and help them break out of their funk. Seattle has been playing some impressive baseball over the past two weeks and they shouldn’t let two heartbreaking losses slow them down. 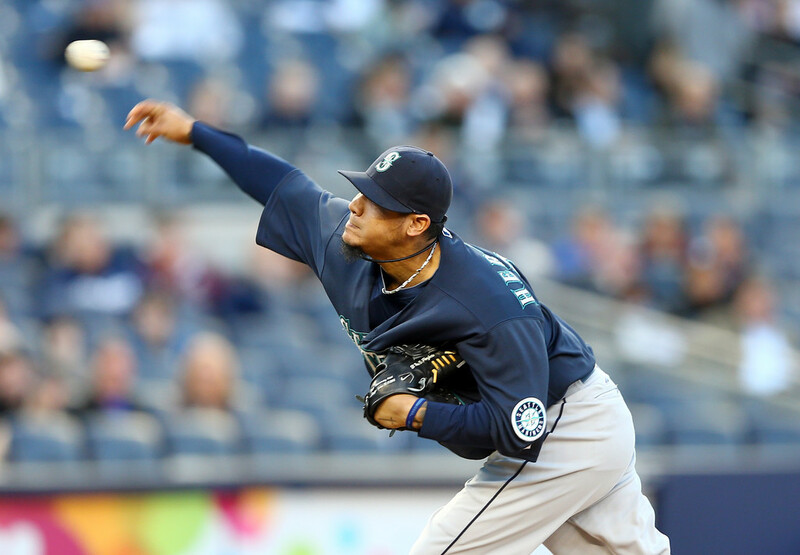 Felix Hernandez is slated to pitch Sunday against Cleveland. He has a 2.90 ERA in over 83 innings facing the Indians. A big thank-you goes out to our ‘Marlins and Mariners Correspondent’ Sam Evans for preparing today’s featured article. Sam is a high school student from the greater Seattle area. He is a longtime Mariners fan, and has been an off-and-on season ticket holder for the last five years. Posted on May 19, 2013, in MLB Teams: Articles and Analysis, The Rest: Everything Baseball and tagged @MLBreports on twitter, @RJA206 on twitter, AL West, asdrubal cabrera, baseball, brandon maurer, Brendan Ryan, cleveland indians, drew stubbs, eric wedge, felix hernandez, indians baseball, jesus montero, joe saunders, justin masterson, justin smoak, mariners baseball, mark reynolds, michael bourn, mlb, nick swisher, oliver perez, sam evans, seattle mariners, ubaldo jimenez, zach mcallister. Bookmark the permalink. Leave a comment.